Description This Atlanta, Georgia hotel has an indoor pool, an outdoor pool, free internet access and non-smoking guest rooms. 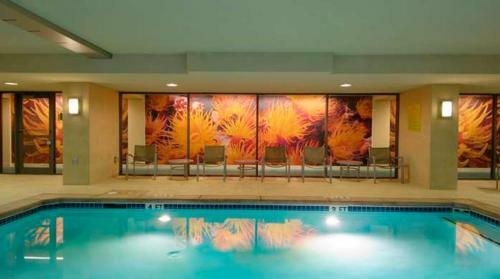 With free Wi-Fi indoor/outdoor pools a hot tub and flat-panel TVs in a convenient downtown locale our guests dig into a garden blooming with amenities at the non-smoking Hilton Garden Inn Atlanta Downtown. 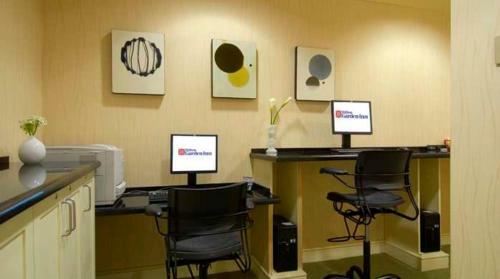 The 13 floors of the Hilton Garden Inn Atlanta Downtown house 242 rooms featuring plush bedding flat-panel LCD TVs with premium channels and pay movies large desks with ergonomic chairs mp3 docks mini-fridges microwaves and coffeemakers. You can print free from your room to the 24-hour business center. The hotel's fine-dining restaurant specializes in seafood for lunch and dinner as well as room service and the lobby oyster bar dishes out free chowder with a show of your room key. Relax in the indoor and outdoor pools and the hot tub and grab some ready-to-cook snacks in the hotel's 24-hour pantry. Valet parking is available for an extra charge. 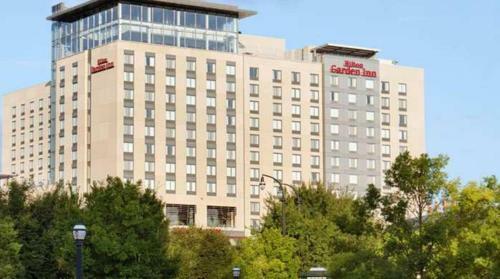 The Hilton Garden Inn Atlanta Downtown is located in the heart of Atlanta adjacent to Centennial Olympic Park the Georgia Aquarium and the World of Coca-Cola and eight miles from the Hartsfield-Jackson Atlanta International Airport. The Georgia World Congress Center and Mercedes-Benz Stadium are just west of the hotel. Add Hilton Garden Inn Atlanta Downtown to your free online travel itinerary.